What's creepier than a stalker song as song by Stephen Colbert? Colbert singing his epic Charlene (I'm Right Behind You), with freshman congressman Jason Chaffetz playing back up, that's what. And all that plunking you hear pocking Colbert's velvet voice? 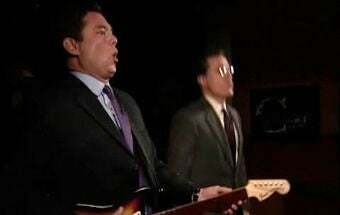 That would be Chaffetz bombing in Rock Band. He landed a 24 percent. Booooo! Watch the video over on the site, so I don't have to deal with their 40-billion line embed code frightening our hamsters to death.